This article is going to be more like those picture puzzles where you look to find the differences between each image..except, instead of being nerve-wrecking, it’ll be quite EZ mode. One big difference between the two outfits is a lack of a tabard on Kirina’s (well, the “model” is Merlaina) part. Because I am Horde (and Horde only ^_^), I am not able to get my mitts on the Alliance tabards that will fit the part of this outfit. 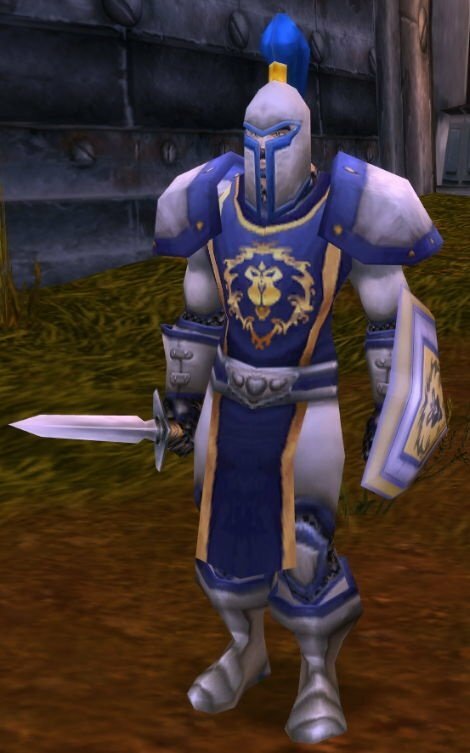 The Stormwind Tabard is an almost identical match to the one worn by the guard NPC – it is bought with Champion Seals through the Argent Tournament. There are two other PvP tabards, should anyone not be able to obtain the Stormwind Tabard, the Knight’s Colors and the Private’s Tabard; however, they lack the lion emblem even though they are similar in color to the NPC’s tabard. Waddell with the Knight’s Crest equipped. 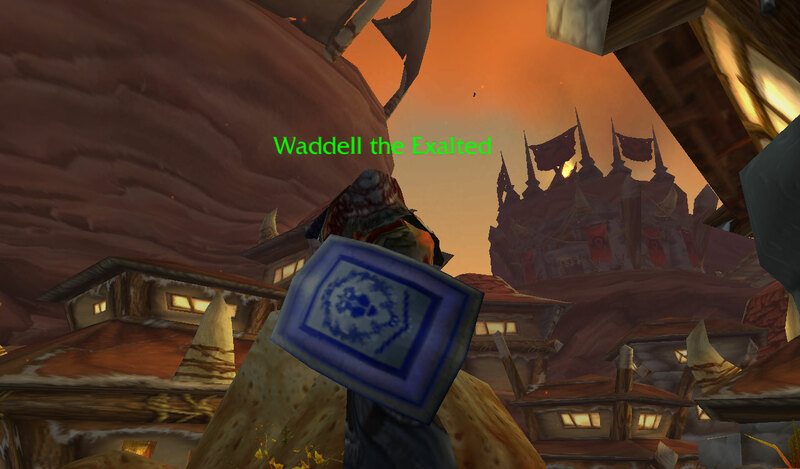 You will notice that the Stormwind City Guard’s shield is kite-shaped. The Knight’s Crest doesn’t have the gold shading, and is a rectangular shield, but, at least it has the blue lion emblem on it. There are a few alternatives to this one: The Commander’s Crest is a boss drop out of Shadowfang Keep; it has the same blue lion emblem, and it also has the gold shading…but, it is still a rectangular shield. The Aegis of Stormwind matches the shape of the Stormwind City Guard’s shield, has the blue lion,…but lacks the gold shading. And, it’s rather hard to come by, as it is a very low world drop. Alliance players can get this exact same model through a reward from Duskwood quest: the Crest of Darkshire. “Wow…those gloves don’t match at all, Kirina!” I know, I know. They’re actually part of the Ironforge Guard outfit I’m working on (just waiting for the helm to come into my possession for that outfit ^_^). Some people use the Edgemaster’s Handguards in their outfits – they are not an exact match in style and color to the NPC’s, but, they do match the color of the boots; however, they are also a very rare world-drop epic. One could even go down the route with the Heavy Mithril Gauntlet…they still don’t match the NPC’s, but, at least they match the shoulders ^_^. The Grimscale Belt can also be replaced for the Brigandine Belt, who has a similar blue stripe to the one found in the NPC’s outfit; however, the Brigandine Belt is gold, while the NPC’s belt is more silver. And, while the Heavy Mithril Shoulders match in the style of shoulder armor to that of the Stormwind City Guard’s, they are more purple in color. Some better alternatives would be the Light Plate Shoulderpads (they match the boot color), or it’s uncommon equivalent, the Ango’rosh Pauldrons. Even still, nothing is an exact match to the Guard’s outfit. You can easily adapt this outfit to be a Stormwind City Patroller – just equip a lantern, such as the Beacon of Hope (or its less rare equivalents), instead of a sword, and, there you have it! Cogspinner submitted a great variation of a Stormwind City Guard. See it here! Wow Fashion Guru has had an awesome take on a Stormwind City Guard outfit, too. See it here! 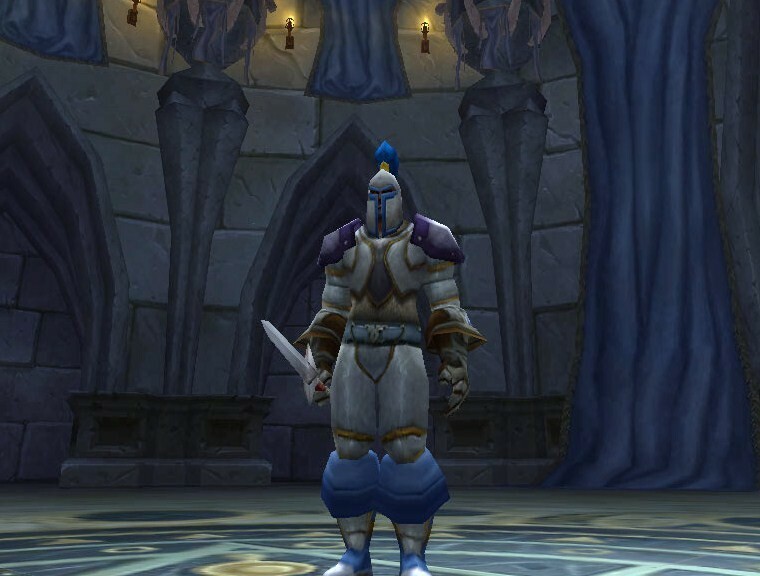 Interested in showing us your own Stormwind City Guard outfit? Do so on the forum – We’d love to see it!